Ultherapy or Ulthera is a breakthrough dermatologic procedure that uses medical ultrasound for non-surgical facelift and neck lifting as well as skin sagging areas such as thigh. Ultherapy works deep below the surface – without harming the outer layer of skin-for dramatic and long-lasting benefits of facial firming, skin tightening and lifting. Improvement around the eyes include lifting of the brow line to reduce droopiness on the eyelids, smoothing of crows’ feet, and a more open, refreshed look to the eyes in general. Sagging skin on the cheeks can be tightened and uplifted, which in turn can improve folds from the nose to mouth, folds from the mouth to jaw, and drooping corners of the mouth. Often, a more defined jaw line and overall improvement in skin texture and evenness of colour are known additional benefits. Ultherapy is currently the only FDA-approved device for facelift, neck lift and eyebrow lift. As with other ultrasound procedures, a smooth applicator placed upon your skin projects an image onto a screen. However, this same unique applicator is then used to deliver low levels of focused heat at just the right depth below the skin to achieve a positive effect, leaving the surface of your skin undisturbed. Your skin’s respond to the energy is increased growth of new collagen. A gradual skin tightening occurs, ultimately resulting in a natural facelift and improve conditioning of the skin over time. How is Ultherapy different from other non-surgical skin tightening procedures? Firstly, ultherapy is the non surgical skin tightening and uplifting procedure that uses ultrasound to image and treat the skin. The ability to utilize an established technology — to both see below the skin and then treat it with great precision — helps ensure both safety and satisfying results. Secondly, ulthera has the various depths of the focused ultrasound transducers that can reach to SMAS layer. It is an innovative treatment for facelift and uplifting of eyebrows and neck without surgery. Ultherapy is a comfortable procedure after anaesthetic application. Anaesthetic injection is required for some cases. Patients may feel a warm prickly sensation beneath the skin when the ultrasound energy is being delivered into the deep skin layer and SMAS layer which are the target tissue. This is how Ultherapy tightens and lifts the skin from deep within, delivering dramatic and long-lasting results. Ultherapy takes approximately 60 minutes. You are able to return to your normal activities right away, and you can apply makeup if needed. Your skin may appear slightly flushed immediately after the treatment, but any redness will subside within a few hours. How many Ultherapy treatment will I need? Most patients will see visible results from ulthera treatment after 1st treatment immediately and after 3 month. The second treatment is possible after 6 month but generally recommended after one to two year. Ulthera can be done on many parts of your face including the forehead, temples, mid and lower face, and jaw line. Recently, ultherapy is currently US FDA proven for non-surgical neck lifting so the neck has usually been treated. The most popular treatment is the full face for facelift and neck for neck lift which will give patients the maximal visible benefits. During your consultation at the Laser Premium Clinic, our doctor will tailor a treatment plan for you. The regenerative process is initiated right away so most patients are able to see immediate facelift. However, the full effect will create gradually over the course of two to three months and some patients will see maximal results only after a few months. 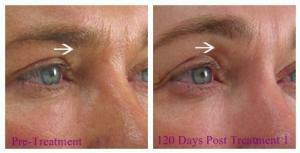 In the FDA clinical trial, nine out of ten patients had a noticeable, significant lifting of the brow line. This resulted in opening up of the eyes and a more youthful appearance overall. Patients also reported firmer, tighter, better-fitting skin in other areas of the face and neck as well. Smoother texture and a more even skin colour are also possible additional benefits. Ultherapy takes 60 minutes. You are able to return to your normal activities right away, and you can put on makeup if needed. Your skin may appear a bit flushed immediately after the treatment, but any redness should disappear in a matter of hours. How long do the Ultherapy results last?As your skin will continue its natural aging process, so you may need to schedule additional treatments over time to maintain the lifting results. Some patients may want to repeat their treatments every year; others may want to repeat the treatment after a longer interval. 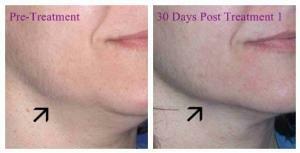 The soonest interval of ultherapy treatment for facial reshaping is possible after 6 months. Apart from proper focused and selected depth of ultrasound transducers, the number of ulthera treatment lines is the main factor to determine how long the results will last. The more total energy, the better outcome it will be. Our expertise doctor has experienced performing ulthera treatment since 2011. Can anyone have the Ultherapy treatment? Ultherapy is safe for all skin types. Any patient who has experienced some sagging of their skin will benefit from this treatment. It is likely that if your sagging is severe, you may need a repeat treatment for optimal results. A good candidate is someone with skin that has ‘relaxed’ to the point of looking less firm. A lowered brow line or sagging skin on the eyelids, for instance, is often the first sign of “maturing” skin. Can Ultherapy be combined with other dermatologic procedures such as botox and dermal filler injection? Yes, of course. There is no contraindication to do botox, dermal filler injection and even other laser therapy with ulthera treatment. 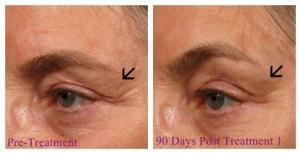 Difference from ultherapy, botox is hit into the specific muscles to reduce dynamic wrinkles. Dermal filler is usually required on the visible area of the volume lost. However, nasolabial fold will become less obvious after ulthera face lift and tear trough is always improved after ulthera treatment around periorbital area. For any patient with deep folds and lines, dermal filler is still indicated. Therefore, our doctor at Laser Premium Clinic will provide you a proper individual treatment plan for the patients’ maximal benefits. Can I do Ultherapy treatment with thread lift? Yes. For anyone who has severe sagging or expects to see dramatic facial reshaping results, thread lifting and ultherapy can be done together to promote the lifting and skin tightening effect. Our thread is entirely absorbable in 1-2 year.